One of our repeat customers had previously been dealing with squirrels, however they were continuing to hear intermittent noises. Our Wildlife Technician ended up crawling through the attic to find bat droppings throughout the insulation. He began pulling back insulation in search of a bat, and lucky enough he was able to find it and remove it from the attic. After he completed a bat proofing treatment. This included installing a one way door, proofing brick to soffit gaps, soffit corners, and valley endings. The customer was shocked to find out that there was a bat living in their home but happy to have an answer to their problems. 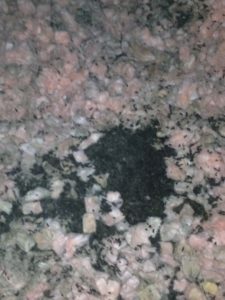 Bat droppings called “guano” found in insulated areas of a homeowner’s attic. Technicians will look for evidence of bats by looking for staining and bat droppings, which are called “guano”. Common noises that you might hear if you have a bat in your attic include scrapping, rustling, or squeaking. If you are hearing noises in your attic and suspect that you have bats or some type of wildlife living there, we recommend that you seek professional help. One of our Wildlife Technicians will visit your home and complete a proper inspection, removal, and proofing of your home. They will make sure that the bats are removed from the home, and that they will not be able to re-enter. We also offer a variety of warrantees to ensure that the problem is completely solved. Call us today for more information about our bat treatment services, and we will be happy to help you solve your bat problems!